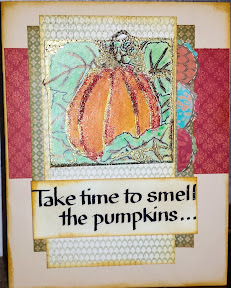 I used some old fall theme papers from CTMH, and versa mark pen to embossed with different embossing powders (Gold, CTMH, orange, Egyptian gold, vintage photo, Ranger). I used my Faber Castles colors and some pastel green to add a smooth finish to the leaves. Finally I used Smooch in dark bronze to outline the leaves. 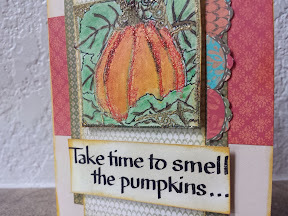 I used some Tim Holtz word dies for the sentiment. 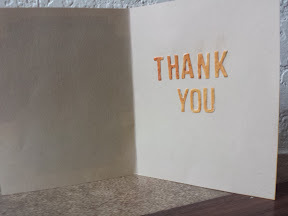 I used the Casual Friday challenge as inspiration to do the metallic embossing. 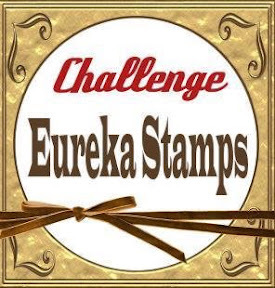 I hope you enjoy this fun card and participate in the Eureka Stamps challenge: Colors of Fall. What a great card! I hope you will drop it in the mail and brighten someone's day! Thanks for joining us for this week's Share Joy Challenge! Jennifer, thank you for mention it. I forgot to comment (spoiler alert) that I am sending this card with my children this Friday for his teacher. Just before the fall break. "Thankful for 3 Girl JAM Fans Blog Hop!"